Six horses come barreling around the rail at Churchill Downs, a cacophony of thundering hooves and screaming fans providing the soundtrack to one of the most astonishing finishes in recent horse racing history. At the 16th pole, Shared Account surges from the inside into the lead. She’s carrying famed jockey Edgar Prado and odds longer than the lunchtime line at Faidley’s. But there’s even more riding on this four-year-old’s back: a shot at validation for the Baltimore businessman determined to resurrect a legendary Maryland farm. As she gallops toward the finish line, it seems the lofty weight of possibility only spurs on the 1,200-pound filly. Not even the renowned horse Midday can catch this brown blur, who dashes one and three-eighths miles in two minutes and 17.74 seconds—an average speed of about 35 miles per hour—to victory. Shared Account’s win at the Breeders’ Cup in November was more than just the biggest upset in the history of the Filly and Mare Turf race, one of racing’s preeminent events. It also served notice, with all the subtlety of a Louisville Slugger to the side of the head, that the once-great Sagamore Farm was back. He’s referring, of course, to the sports apparel company he founded in 1996 in his grandmother’s Washington, D.C. row house. It’s grown into a global brand, and Plank says he’s using the same blueprint to turn Sagamore, the 530-acre Glyndon farm once home to the now-mythical stallion Native Dancer, into nothing short of America’s next great sports franchise. Shared Account’s win is the most visible chapter in the story Plank is trying to create, but it isn’t the first. He bought Sagamore Farm in 2007, and since then has overseen its physical renovation and the creation of a racing organization from the horseshoes up. Just about everyone else in the horse racing world considered Shared Account an afterthought. Plank was both puzzled and amused by the indifference. While stunning to most, the swiftness with which Plank has steered Sagamore back to the winner’s circle is the natural speed at which he’s always operated. The 38-year-old conceived of Under Armour while he was a football player at the University of Maryland; last year, the company posted revenues of more than $1 billion. Before he set out creating the “biggest, baddest brand on the planet,” Plank was the Terrapins’ scrappy special teams captain. Originally a walk-on, in five years he never missed a practice. Not to say that college was all work and no play. As an undergrad, he attended his first Preakness, and it was the fading fortunes of the second jewel of the Triple Crown that ultimately sparked his entrance into the horse business. For years, the crumbling infrastructure of Pimlico Race Course and the overall decline of Maryland racing have raised fears that the state could lose the iconic race. In 2006, an old high school teammate of Plank’s, Tom Mullikin, stopped by for dinner. After 9/11, Mullikin had suffered what he called a “quarter-life crisis,” ditched the corporate world, and moved to Kentucky to work on a horse farm. Once the two men had polished off a couple of steaks, Plank pulled his buddy aside: He was getting into horse racing, and he wanted Mullikin to head up his operation. “I said, ‘Well, good luck. It’s a tough game, there’s a lot of sharks out there,’” Mullikin recalls. In his old friend, Mullikin saw the same qualities. So he took a leap of faith, quitting his job in the heart of horse country to work for a man in Baltimore with absolutely no experience in the game. They set out looking for a farm. No matter where they went, time and time again they’d find their way back to Sagamore. Though it looked all of its 80-plus years, Sagamore’s pedigree was sterling. Founded in 1925 by Isaac Emerson of Bromo-Seltzer fame, it was bequeathed to his grandson Alfred Vanderbilt when he turned 21. A member of New York’s wealthy Vanderbilt clan, Alfred turned Sagamore into a world-renowned farm. The Queen of England kept a broodmare on the property during its heyday, but its most famous resident always will be Native Dancer. From 1952 to 1954, he won 21 of his 22 career races, including the Preakness, and captured the public’s imagination like few horses before him—or since. His popularity was such that, in 1953, TV Guide named him one of America’s three most popular figures. (Ed Sullivan and Arthur Godfrey were the humans who made the cut.) Vanderbilt sold Sagamore to developer James Ward in 1986. For the next two decades, it floundered, its deterioration in many ways a metaphor for a once-proud industry now struggling to survive. But Plank saw only promise. Stroll through the farm today and it’s tough to argue. A winding drive leads from Belmont Avenue to the “Big House” atop a hill. In the foyer, photos of famous Sagamore residents Discovery and Bed o’ Roses hang alongside images of Native Dancer, including a framed copy of his 1954 Time magazine cover. A large Maryland flag hangs over a fireplace in the living room, leading to a back patio with sweeping vistas. All this beauty carries a weighty price, but Plank’s pockets are plenty deep. His last public disclosure reported that he owns 12,093,750 shares of Under Armour stock, which was trading at about $68 a share on March 14. While he won’t disclose how much he paid for Sagamore, running an operation its size is estimated to be a seven-figure endeavor. Eleven miles of new four-board oak fencing have been installed, and 150 acres of corn and vegetation have been returned to pasture. The broodmare and foaling barns have been renovated, and now include an observation room, video monitoring system, large stall windows, and skylights. The three-quarter mile outdoor track was redone using a synthetic base that includes recycled Under Armour shirts. Down the line, the 90-stall training barn with a quarter-mile indoor track may undergo a facelift. Sagamore now houses 36 horses, and is expecting eight foals this spring. 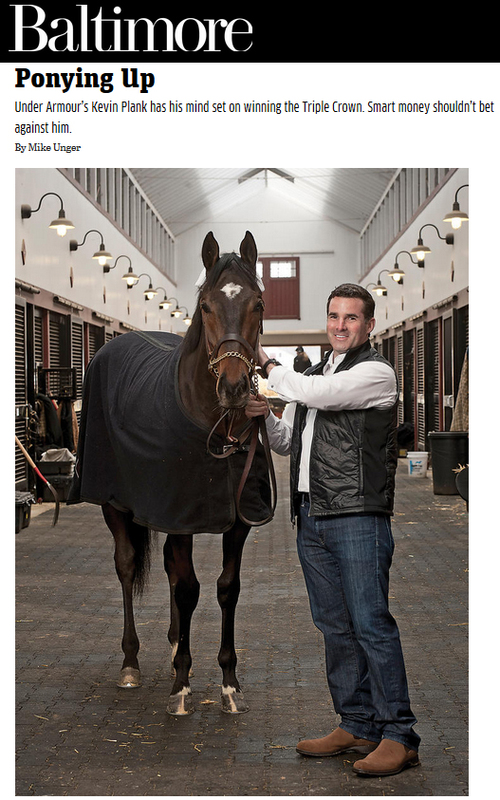 Inside the very first horse trailer that rolled onto Kevin Plank’s Sagamore was Shared Account, purchased as a yearling for $170,000. Shared Account had won just five of her previous 14 starts when she entered the Breeders’ Cup. The sharps clearly weren’t sold: a $2 Shared Account win ticket wound up paying a wallet-fattening $94. Plank coyly deflects questions about how many of those he held. “Enough that I was sticking money in my socks and my underwear,” he says. When you combine that with the official winner’s share of $1.08 million, it was a dream day for Plank, and perhaps more importantly, for Maryland racing. At one point before the race, Plank was dismissively ushered aside by the security detail of an Arab sheik. But after it, his place at the podium in the sport of kings was undeniable.